There isn’t any doubt about the fact that 2016 was indeed a breakthrough year for most of the technologies that we’ve been watching. For example, Artificial Intelligence, Augmented Reality, Virtual Reality, self-driven cars, Chatbots, are all those technologies which experienced spellbound growth in terms of adoption rates, practical applications and people were indeed taken aback to witness their staggering popularity. It is true to say that robots are already here and so they can’t be coming. They are here and taking away jobs from the humans. Experts predict that rates of adoption and innovation won’t slow down in 2017 and hence we’ve made a clean list of the crucial emerging tech trends which are going to disrupt the environment. The only thing that you can be sure of in 2017 is that irrespective of working in risk management, strategy, start-up firms, operations or marketing, you’ll require leveraging some or most of the digital technologies which are about to emerge. Here are few to note. 2017 will definitely be the year when the much-awaited science fiction will be accepted as reality and robots will be employed in various different job positions. In fact, they will also be in the line of production. As there is an increased investment in robotics, there will also be a sudden hike in the existence of sobots, which are social robots who have the power of talking, reading; using digital tools and they even have emotions. 2016 was the year which saw an increased use of fitness and health trackers in the health care industries but it didn’t see any huge adoption of smartwatches, which was predicted by the analysts. Unless there are some noteworthy increases in functions, there will be enough disruption created while experimenting technology within the body. More than 50000 people have implanted electronic RFIC and you will be rather surprised to note that Intel will invent a chip which could control the smart objects inside the human brain. Artificial Intelligence and its advancements drove cloud computing and machine learning which got drastically positive results in performance of Chatbots. Now in 2017, they will not only be used for purposes of customer support but the big tech companies will invest in bots which allow consumers to interact with bots. 2017 will welcome the chatbot economy where jobs like conducting research or booking tickets will be done by bots instead of apps. The bots will be fuelled by Artificial Intelligence. Successes in machine learning have demonstrated Artificial Intelligence as the most dependable way of replacing the working patterns of the smartest people. This year, 2017, there will be headway with cultural shift which is needed to trust them with more graduate jobs. AI journalists, legal bots and there will also be robot doctors which means that all such white collar jobs will be lost to such path-breaking technologies. There was too much investment in autonomous vehicle was big in 2016 and this wasn’t just from Tesla and Google. Meanwhile, taxi companies like Uber will start trialling self-driving taxis. Although safety is still a concern, there can be some big developments in the biggest disruptive technology, in trucking traction industries. 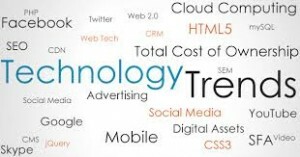 Therefore, as we see, the above listed technologies are going to be the biggest ones in the industry and hence people need to brace themselves for accepting them.